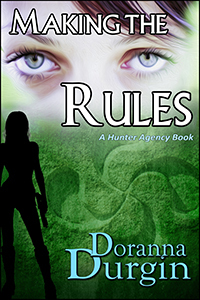 Kimmer Reed is a Hunter Agency operative, a street foundling escaped from an abusive family and raised to be code-name Chimera–a fierce, savvy loner with a natural gift for reading people. Now on her first assignment with the one man she trusts–the one man she can’t read–she finds herself overseas in the Basque countryside, framed for the theft of the very antiquity she has been sent to guard and doubting her ability to work with a partner at all–never mind the man she loves. Rio Carlsen, former CIA field officer who left the agency with scars both physical and emotional, joins Hunter Agency field operations with reservations–and only because his partner is Kimmer. Now he’s caught in the schemes of a woman from Kimmer’s past. Political terrorism, antiquities theft, and revenge–this woman wants it all, and she’s on her way to getting it. Framed, cut off from the agency, and tangled in Basque Nationalist splinter terrorist groups, the biggest challenge Kimmer and Rio face is coming to terms with their pasts and with each other–so they can live through the day on the way to saving it. Clever, strong, high-action heroines–a taste of Alias, Buffy, Xena, and Covert Affairs, including heroes who are strong enough to capture these wild hearts. HIDDEN STEEL:Steve Spaneas doesn’t have a clue. Who’d have thought that the woman who stumbles into his gym, looking and acting so very much like a street person off her meds, is really a CIA case officer whose memory has been obliterated with experimental drugs wielded by some very bad people? 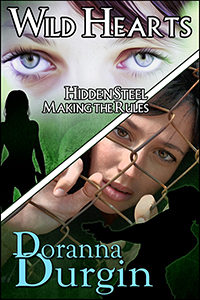 MAKING THE RULES: Framed, cut off from the agency, and tangled in Basque Nationalist splinter terrorist groups, the biggest challenge Kimmer and Rio face is coming to terms with their pasts and with each other–so they can live through the day on the way to saving it.